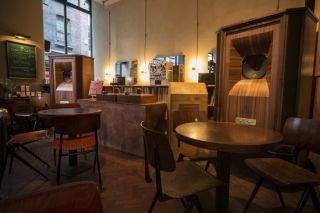 Spiritland offers "unique new music space" at London's Merchants Tavern | What Hi-Fi? A new hospitality concept bringing together food, drink and "world-class hi-fi" is making its debut at London's Merchants Tavern bar and restaurant with the opening of Spiritland – a "unique new music space". Spiritland is described as a place "for appreciating music in a leisurely and luxurious style" - with a collection of vinyl spanning the last five decades, in genres ranging from rock 'n' roll to country. It is taking up residence at Merchants Tavern for a three-month period, before opening as a new, permanent restaurant, bar and members' club next year, at a London location yet to be confirmed by Spiritland. A number of guest programmers have been recruited to select each night's music, with the tracks being played on a two-channel system. In addition to vinyl, Spiritland also uses CDs and 0.25in tapes. The system includes Tannoy Westminster GR horn loudspeakers; Canary M500 monoblocs with 300B triode tubes; and modified Technics 1210 turntables with Isonoe arms, suspension feet and power unit. A Bozak CMA-10-2DL mixer is also used at Spiritland, together with a Studer B67 stereo cassette machine and a Sony CDP-D12 CD player. The three-month residency at Merchants Tavern runs until 1st January.